Images from Opening Reception: Feb 21, 2014. 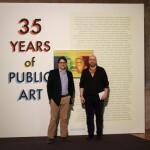 Finally, the exhibition “35 Years of Public Art” in Chicago is open! I was waiting for it since the time I first heard about it, sometime in December 2013. In a place like Chicago, where, at any point of time, there so many art exhibitions to choose from, this was an obvious priority! It’s on a topic close to my heart: Public Art in Chicago! 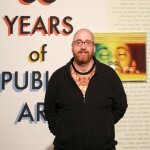 Chicago is famous for it’s huge public art collection, and here is an exhibition showcasing the diversity and range of public art; and, is curated by Nathan Mason, who is Curator of Exhibits and Public Art at the Department of Cultural Affairs and Special Events [DCASE], City of Chicago! He has curated many outstanding exhibitions, so I was really looking forward to this exhibition! I attended the Opening Reception and spent quite some time there! There was so much to see. It is one of those art exhibitions, which goes much above aesthetic appeal. It informs, educates, nourishes, and creates curiosity to explore. 35 Years of Public Art..
Artworks, maquettes and design proposals are part of the exhibition. 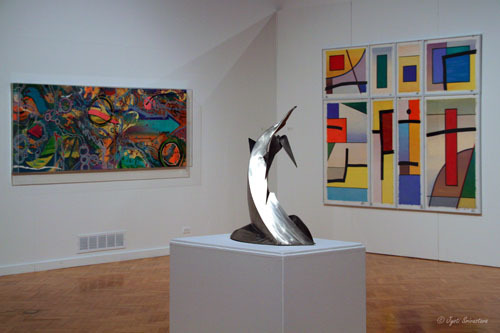 Above Image: Maquette of “Flight Forms” by Richard Hunt [at Midway Airport]; on the left is painting “Space Jungle”  by Dzine at Humboldt Park Library, and to the right is original painting “Intersection II” by William Conger, which was transformed into art glass at 18th Police District. But before I go into more details about the exhibition, I have to say, that this is a very impressive transition from the previous exhibition, which was on Street Art of Chicago [Paint Paste Sticker: Chicago Street Art.. click here..]. In a public space, it is difficult to distinguish between Street Art and Public Art! Both maybe visually appealing and maybe used to create public awareness. But there are differences. Whereas Street Art is usually a spontaneous expression by an artist, Public Art is more deliberate and planned! Street Art maybe about rebellion and protest and sometimes illegal; whereas Public Art is sanctioned by the city! Street Art is usually seen on abandoned and dilapidated walls, whereas Public Art is on well maintained city properties. I have even seen the difference termed as lowbrow and highbrow art. But there has been an increasing trend towards greater appreciation of street art, and some artists, who began as street artists, have their artwork displayed in famed galleries and auctioned at high prices. From my personal experience, I have to say that I have come across many murals on the street and wondered if they were commissioned public art work or a more spontaneous work of a street artist! While I am at it, let me also say that sometimes, it is equally difficult to differentiate between Private Art and Public Art. Pioneer Court in Chicago is a prime example. The infamous “Forever Marilyn”, by Seward Johnson, was not a part of city’s public art program, nor was the acclaimed “God Bless America” or “King Lear” by the same artist, at the same location, Pioneer Court, which is actually private property owned by Equitable Life Insurance Company & The Chicago Tribune Company. The Art exhibits at the Pioneer Court are brought to us by Zeller Realty Group. [I had to get that cleared!].. For more, click here.. But City of Chicago has a huge Public Art Collection. Bulk of the city’s public art collection resulted from implementing the Percentage-for-Art ordinance. 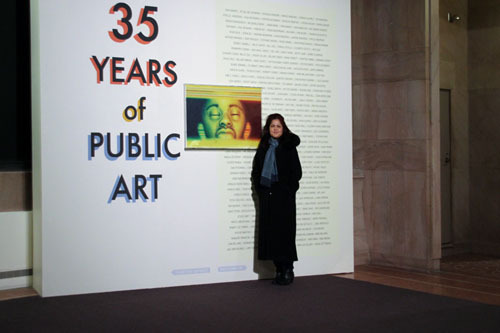 In 1978, the City Council of the City of Chicago passed a Percent-for-Art ordinance that requires 1.33% of the construction or renovation budget for city owned buildings be set aside for the creation of artwork to be placed permanently in the publicly accessible spaces of its built environment. 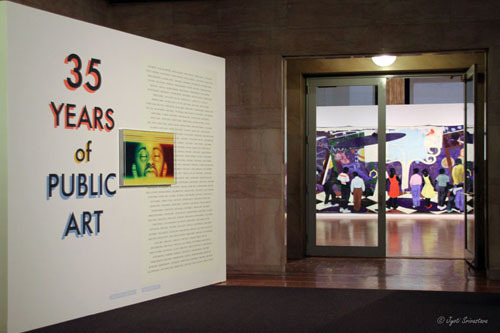 Later that year the Chicago Public Art Program was established to implement the city’s Percent-for-Art Ordinance. This program has funded many of the public art pieces in Chicago. The City of Chicago was one of the first municipalities in the United States to implement such an ordinance. The City of Chicago has over 500 works of art created by more then 300 artists. These are spread over 140 public spaces and municipal facilities across Chicago including libraries, police stations, fire stations, office buildings, health plazas and other public buildings. Now coming to the exhibition, as we enter the Exhibit Hall, to the left is an impressive sculpture [as seen in the image above] named “Pi-Cow-So” by Herb Migdoll . 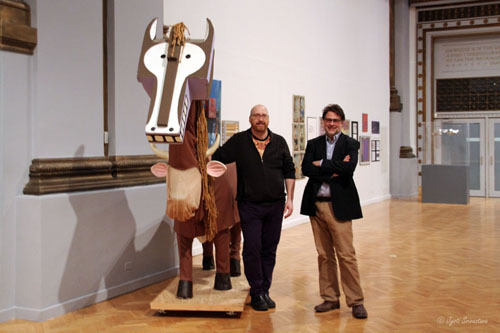 It is based on the horse from “Parade”, the Picasso designed ballet in the repertoire of the Joffrey Ballet of Chicago. 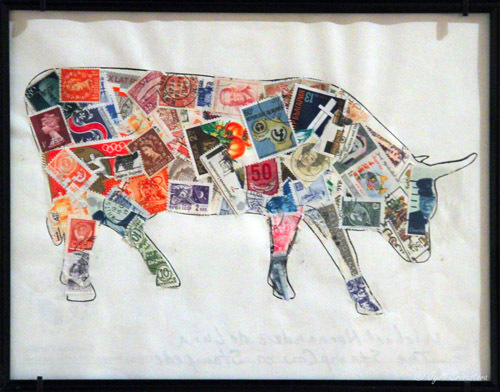 I think the piece is very strategically placed.. Its name “Pi-Cow-So” immediately reminded me of two things. First, the monumental sculpture at Daley Center Plaza by Pablo Picasso, which is said to be a catalyst in attracting many nationally and internationally famous artists to Chicago.. like Alexander Calder, Marc Chagall, Claes Oldenurg, Henry Moore and Joan Miro to name a few. It is also said to be instrumental in formation of the city’s public art program. Second, Pi-Cow-So also reminded me of the famed Special Project by the city’s public art program, “Cows on Parade”, which was later followed by many other cities in the country. 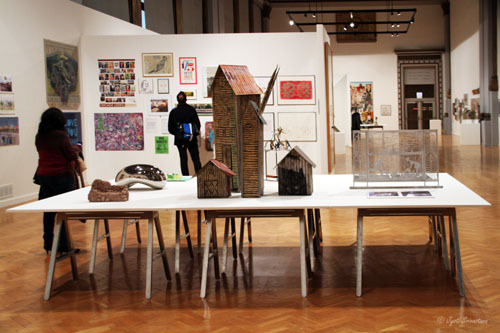 The exhibition includes a selection of artworks from the city’s public art collection. Fascinating mural ” Knowledge and Wonder”  by Chicagoan Kerry James Marshall is placed right in the center of the Exhibit Hall. The walls on north and the south end of the Exhibit Hall also have murals from public library, by well know Chicago artists. 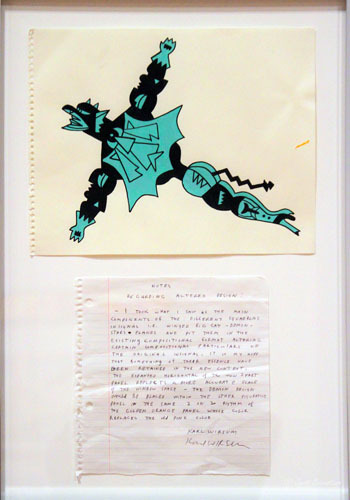 The north wall has Roger Brown’s “Snake Charmer”  from Harold Washington Library Center and the south wall has Bernard Williams’s “Forces of Pullman Labor”  from Pullman Library. Another highlight of the exhibition is the inclusion of many maquettes and proposals of works that have been commissioned and installed. These are also a part of city’s public art collection. One can see small scale models for Anish Kapoor’s “Cloud Gate”, Richard Hunt’s “Flight Forms”, Barbara Cooper’s “Transitions”, Christine Rojeck’s “Fruition”.. among many others..
Coming to city’s public art collection, three sites are particularly notable, for the size and depth of their art collection. The exhibition brings out art and/or marquette from each of these sites..
– The Bronzeville Streetscaping between 24th and 35th street on Dr. Martin Luther King Jr. Drive.. click here.. 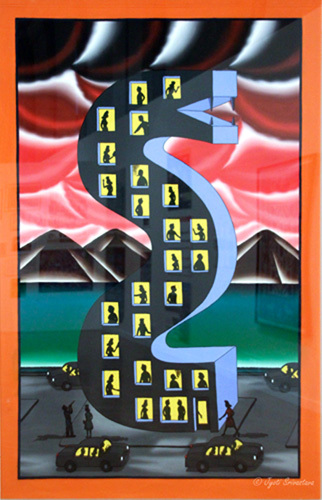 Between 2004 to 2009, the city’s public art program worked with the Chicago Transit Authority [CTA] to oversee the selection and implementation of artworks in Blue Line [now Pink Line], Brown Line and Red Line. One overarching concern the CTA expressed in the commission process was that the work at hand had to be of the most durable nature possible. This gave artists involved the opportunity to work with fabricators and industrial materials not part of the usual vocabulary and has resulted in a particularly unique and vibrant collection of mosaics and manufactured objects. However, since 2012, when CTA restarted its art program, it appointed its own administrator to oversee the CTA Arts in Transit Program. The city’s public art program also consults with other agencies, like the Millennium Park selection process, the Chicago Park District’s art programs and the latest being the 606/ Bloomingdale Trails. The city’s art program also oversees exhibits at the City gallery in the Historic Water Tower and Open Studio project at Page Brothers Building. The Department of Visual Arts is definitely understaffed and overworked. But they keep coming up with innovative ideas which provokes and delights people. They bring out work of many local artists, while also bring to Chicago many nationally and internationally recognized artists. 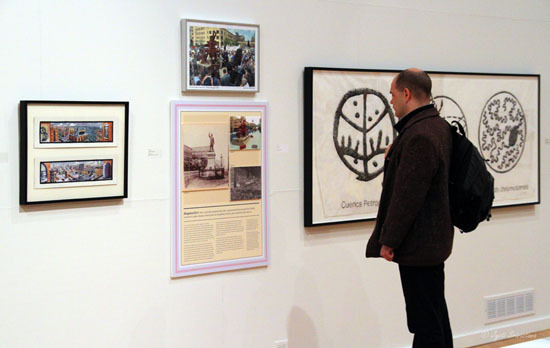 Check out the exhibition and explore the city’s public art collection! 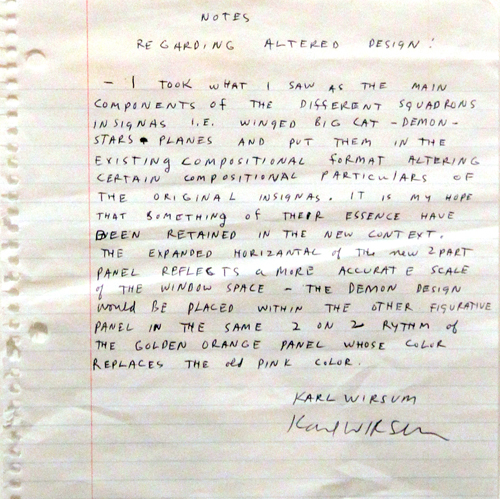 A bonus is Karl Wirsum’s hand written notes! 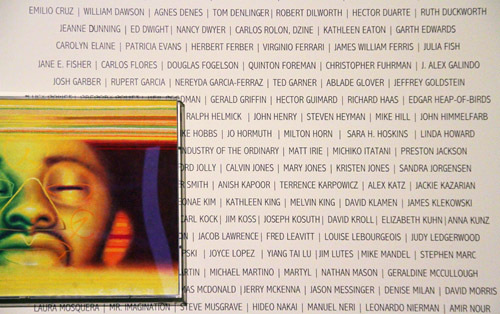 The impressive roster of artist names including Lorado Taft, Anish Kapoor, Don Baum, Ed Paschke, Virginio Ferrari, Terrence Karpowicz, Tony Tasset and many many others..
as I have website /blogs on Public Art Chicago for a long time, since 2007. 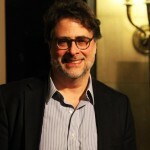 Daniel Schulman [Program Director of Visual Art at DCASE] for bringing this exhibition to the city. 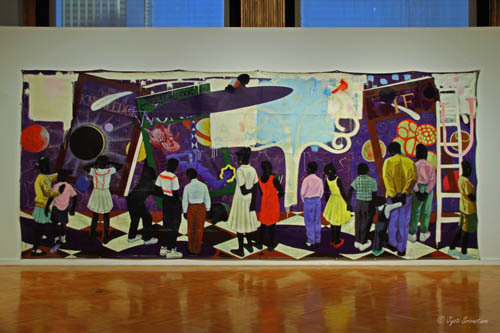 Exhibitions at Chicago Cultural Center.. click here..
Where are the cows now.. click here..
Public Art in Black Metropolis-Bronzeville District.. click here..
Funding of Public Art.. click here..